“Despite being separated by hundreds of miles and the vast expanse of ocean, the familial, cultural, and historical ties that bind Bermuda with the islands of the Caribbean are unbreakable,” Opposition Leader Marc Bean said in his address to visiting Caribbean delegates. Mr Bean was speaking at the 17th Biennial Conference of Presiding Officers and Clerks of the Caribbean, The Americas and The North Atlantic Region of the Commonwealth Parliamentary Association, which was held in Bermuda from October 25th to 29th. Delegates from fourteen Caribbean countries attended, with representatives from Anguilla, Antigua & Barbuda, Bahamas, British Virgin Islands, Cayman Islands, Dominica, Guyana, Jamaica, Montserrat, Nevis Island, St. Christopher & Nevis, St. Lucia, Trinidad & Tobago, and Turks & Caicos Islands. Mr Bean said, “Despite being separated by hundreds of miles and the vast expanse of ocean, the familial, cultural, and historical ties that bind Bermuda with the islands of the Caribbean are unbreakable. “Bermuda owes a tremendous debt to the Caribbean. Whether it is the families that emigrated to Bermuda from St. Kitts and Nevis, the teachers who formed the bedrock of our education system that came from Jamaica, the Bajan policeman who diversified and strengthened our Police Service, the Trinidadians that inspired our various cultural celebrations, or the longstanding economic ties with the Bahamas and Turks and Caicos; these island nations and others, make up some of what is great about Bermuda. “Some would seek to deny or downplay these ties. Some would attempt to distance us from the Caribbean, and act as if we do not have a vested interest in what happens in the region, and to our neighbors – no, our cousins, to the south of us. “For all of our economic strength, our high GDP, or our education rate, we still have much to learn from you…the importance of self-determination, the value of culture, and the societal commitment to putting your native people first in jobs, opportunities and success. “A. There is a fundamental prerequisite that must always be considered sacred, that of Good Governance. We have witnessed recent events in our sister island of Trinidad and Tobago, which brought scrutiny and international condemnation, where the then Opposition Leader and Party where subjected to unparliamentarily decisions and actions that served to undermine the democratic process. “We in Bermuda can relate to such an experience, and suffice it to say, such activities certainly do not foster the type of relationships necessary to serve our peoples interest towards the goal of peace and prosperity. “B. There is a global trend in politics that sees a move towards using legislatures for the purpose of centralizing power and extending control over the citizenry. Today, this brings into light the stark choice that we have in serving our respective peoples; one, which increases the role of the State in people’s lives, or one, which increases the freedom of our peoples. “Freedom or Control is the relevant question that must be addressed at this conference. Our response will determine the effectiveness of our efforts to manifest the theme of these discussions. May we choose wisely. Look the fact is Bermuda is NOT and cannot be carribbean. To want it to be is just illogical and senseless. We are further away from the Carribean than pretty much any other country, you name it! We are like 1000 miles away and it is closer to get to half of north america! The carribean is part of south america and the gulf of mexico. People who dont look at or know maps may think in their little heads that all de islands be together bye! But it don’t work like that! Carribean islands are TROPICAL because they are near the equator. Where is Bermuda? It is NOT tropical and NOT near the equator, but in the NORTHERN ATLANTIC OCEAN with near seasonal temperate climate and subtropical conditions. We are not near the carribean, nor are we part of its climate zone! Why not say Bermuda is part of the Azores or Morocco or Europe or canada? We are close to america and canada and have more relevance and history with them than the carribean. We have no rainforests, but those islands in the carribean do! Totally different. I know why certain people here want our island tied to the carribean. It is shallow and based on skin colour alone, an entire concept based on ignorance. We have no cultural ties to the carribean and they practice Carnivals which are a south american cultural practice. We are NOT part of the Carribean, get over it. We don’t need ties to them. Why not get ties to Cuba? Oh wait….. Ewart already did that…. he got us the Cuba bus depot and the refugees! Well its two ways of looking at everything in life, with that said, one can say they know why certain people don’t want our island tied to the caribean, it could also be “shallow” and it also might be based on skin color alone, and lets say, without stereotyping, it could also be “ignorance” alone,, yeah right,, smdh. For what its worth, geographically, you are correct, BERMUDA is not in the caribbean ocean and many miles away from the other caribbean islands, but the culture is very similar when you look at simple things like sports, music, cuisine to name a few.. Both my parents are from the West Indies. My Father from Turks Island, my Mother from Jamaica. We may be a thousand miles away but the ties to the islands to the south are strong. There is so much that we can learn from them and so much that we can share with them. Stand up and say I’m proud of my heritage. I don’t feel that way but the Party who made this speech above and their supporters evidently do. Well against certain so called ‘paper Bermudians’ at least. Be proud of your heritage either way. I don’t understand this logic… who would be a “real Bermudian”? Anyone that isn’t a first generation “paper Bermudian”? We all came from somewhere else… if not the Caribbean, the UK or elsewhere. So wouldn’t this make us all by lineage “paper Bermudians”? I was born in Bermuda. My family history in Bermuda goes back to 1629. The ancestors traveled between Bermuda and Turks & Caicos trading salt then settled there. Turks & Caicos was a de facto colony of Bermuda. I am a REAL Bermudian and proud of that too! That’s what those devils told the Africans when they shipped them over,whipped and beat them to force them to deny their name, culture and religion, interesting to see that spirit still exist. You can take a Lion out of the jungle and cage him, but his nature is to roam free and dominate. It’s OK for those who think like this. It’s amazing though when holiday time comes around and all those with comments like this and anti foreign everything beliefs forget all about their sentiments. Instead of walking behind the trucks for “Carnival” why not go up Dockyard with your Bermuda shorts on and hold up your “Bermuda is Subtropical not Caribbean” placards and protest it? We don’t need that here right? We have gombeys to entertain us and the tourist for hours on end. Let’s not stop there either. We don’t need their music and cultural influences in the clubs, bars and everything else no no no. We can play Bermudians love to Drink, Come Around, & Jam Bermuda on repeat.. Oh wait, someone from the Caribbean sings Jam Bermuda. We don’t want that then. Point being if your “against” something be “against” it all the way and not when it’s convenient. Next to the America’s Cup the 2nd biggest thing to happen locally this year was Carnival which will most likely get bigger and bigger(if your protest fail). But we don’t need that it’s Caribbean. Let’s have a gombey festival instead… Oh wait, gombeys are in the Caribbean too. You know what’s shallow? The attitude of some that feel that the Caribbean is somehow ‘beneath’ them. No cultural ties? What a load of nonsense. Spot on,we were told too long by the Colonist that we were better then those people to the South of us because of our strong economic advantage ans solid infrastructure. We bought into it hook line and sinker, due to our ignorance we alienated ourselves loosing our identity and embracing the Colonist,only to be treated like second class citizens and being neglected in top jobs, opportunities and success. You represented the PEOPLE of Bermuda well. Spot on,, I am so grateful for blogs and forums, for it gives me an insight into the minds of the people around me in my community.. It can be down right frightening at times. TGIF.. So imagine how frightening it was for our forefathers who went through verbal, physical and economic abuse. No need to have fear today, they just rant online but wouldn’t dear verbalize it in public, bunch of spineless cowards. What’s interesting about the Caribbean is that each island has its unique culture but they ALL have one thing in COMMON, They ALL came over on the same ships and just got dropped off on different islands. What would you moan about if not what may have happened to your ancestors? My grandmother lived through the London blitz and faced death several times. My grandfather was a pow in Germany, but I don’t constantly moan about it. Grow up or at least get on with your school work. The difference is European’s in the Western Hemisphere did not and STILL do not go through the hardships of injustice as Blacks did. Yes your grandparents probably did go through that, but after that their descendants didnt go through racism and social injustice. Yeah, white people all had plantations and hundreds of servants. Fact. None of them were poor. No white person in the entire 20th century ever had a day when they were poor, or underpriviliged. Flibber libber lobber lobber lobber. More white racist insults from the privileged and the entitled. They just Colonized the Africans and their descendants through slavery and injustice. Flubber lubber lobba lobba libba. The PLP elite have ties to the Carribbean, since most of them are descended from people who came here in the teen’s and 20s to work in the dockyard and just never went back home. Geographically Bermuda is basically the same distance from the Carribean islands as it is from Nova Scotia Canada. The best description of Bermuda is mid Atlantic, and the vast majority of its people, black and white have no real connections with the Carribbean. So that means no Europeans in Bermuda have ties to Uk,Canada, Portugal and Azores. Geographically, yes Bermuda is distinct from other island in this part of the world… but come on. There are many Bermudians here with some immediate tie to people from Caribbean nations. Shoot, we have businesses here that have also set up shop in Caribbean nations. Both BNTB and BoB, for example. You can find Grace products in supermarkets here. And on the other side, have you seen the Barritt’s Dark and Stormy billboard in Barbados? It’s not just so-called “PLP Elite” that have connections, but several of the ‘common man’ as well. The Caribbean is like Bermuda’s “Side chick”… we have fun when we hang out together, share some similarities and party well together to relieve stress or when we need something to get done. but don’t be mistaken, we are not of the same company. We cannot be seen to be associating with each other to affect the status quo. Bean is playing politics, be honest. the Caribbean has access to internet now you know!! Contrary to Mr. Marc Beans ego there are other facts that will always remain, we who are Bermudians are just that, Bermudians…British subjects and that my friend is the bottom-line. Do you really think this is an ego thing? Look at who Marc Bean is addressing, for goodness sake. Caribbean officials. Why wouldn’t he say something complimentary about the relationship? The same way that you and others may show admiration for the British connection, others will feel the same about the Caribbean one. Review my comment above: “Contrary to Mr. Marc Beans ego there are OTHER FACTS that will always remain, we who are Bermudians, are just that, Bermudians.” No wasn’t any mentioning of anyone not being proud of their “roots”. The point was / is, we are a British Colony and will remain just that because when we look at the big picture, we are all from elsewhere. The only unbreakable ties we share with those in the Carribean is BLOOD, we have been scattered and gone all our own way so when they come here, they have their OWn association and do not assimilate as though we are all relatives.. Many people claim relation but why do we have various associations in Bermuda ? Me thinks its because Bermuda is another world and the term Bermudian applies to a very special group of people who are not considered outside of this island as anything more than a great opportunity..
That’s because Caribbean people have been brainwashed by Colonist for centuries into being loyal to the plantations that they were assigned to. Before the Europeans found the Caribbean, it was populated by Arawak, Carib Indians and other groups, after taking a few natives back to Spain they found gold on their belts and masks they were wearing, leading them to exploit the lands and the natives to work in the gold mines, until they were practically wiped out by the Spanish and Portuguese. Then sugar was a luxury in Europe, now enter the African slaves whom were brought to the Caribbean by the millions to work on the sugar plantations which like the gold, help to finance Europe. Due to Slave Rebellions and the Abolition of slavery, Africans and there descendants fought tirelessly for Equal, Rights and Justice, until finally acquiring Independence from their European oppressors, hence is why there is such loyalty, pride and individuality among the Caribbean islands, but this is the generation that is awakening the PEOPLE and making them aware of the unity that binds us together in realizing that even though we are geographically apart, we ALL had and have the same struggle and at one point and time, our ancestors came on the same Slave ships and dropped off at different islands and we were mentally Colonized into being LOYAL to those islands, instead of us realizing that we are ALL ONE BLOOD. Among all that, there is some cemmendable points, but the sad truth is that the tone and construct of the speech is very much in line with the PLP electioneer agenda, criticize the OBA as much as possible. While there was no direct referencing in this, it was there, not between the line, but seething from each one. Out of all of it, I will only quickly touch on one of the point made and the misrepresentation it presents. The irony of the statement “societal commitment to putting your native people first in jobs, opportunities and success”. The fact that Mr. Bean seems to have missed is that throughout most of the Caribbean, the vast majority of their developments in fact do not go to local interests. In fact, in several instances, where countries have brought in the Chinese to build hotels, the Chinese have also shipped in Chinese to do it. Yet when we have a foreign company come here to build something for us with local construction and it is condemned. There is just so many like examples in that speech alone that shows that either the PLP are oblivious to the truth of what goes on in the labour market in the Caribbean, or that they knowingly gloss over it in order to present their own ideological version. Yes they ship their workers in, but majority of the workers on the jobs are local. Not really, but also primarily in the low skill jobs. 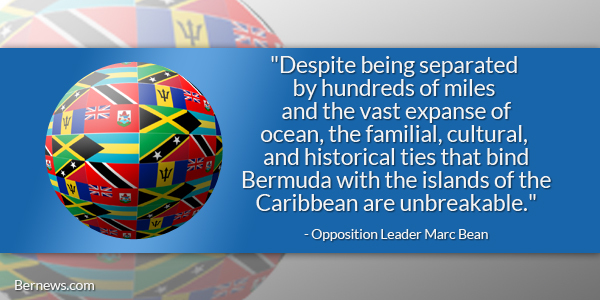 Also many Caribbean nations employ commercial immigration policies, the same policies the PLP decry. So is Bean blaming the state of our public education on Jamaicans? Not me, I am Bermudian! Why is it that I as a Betmudian cannot comment on a legal case in the media yet the Carribean Association can? If you are an association here that is fine but do not comment on our affairs and make it seem as if your opinion has more weight than a born Bermudian. Same goes for the Canadian Association of whatever they were. What a fantastic speech! @Bernews, did the Premier also give a speech? It would be good to see what he had to say, as the Opposition Leader made some powerful points. 6 dislikes? Wow! I wonder if any of you would care to comment or address the two points that Opposition Leader Marc Bean raised? The second point in regards to this idea of “Freedom or Control” is interesting, by reason that I too have noticed this “Trend”, and discussed it with friends. What is surprising is that a politician is willing to raise it in such a forum. I guess I should give more attention to the Opposition Leader and what he has been articulating.